What Is a “Three Roller Indexing Labeling System”? Re-Pack three roller indexing labeling systems are those designed to “orient a cylindrically shaped item and apply a wrap-around label.” In this labeling process, the label application is accurately aligned to a specific spot on the individual product item. This unique labeling process can be accomplished with a fully automated, in-line system or as an off-line, semi-automatic, hand loaded process. In both approaches, printing of additional information on the label can take place automatically. In the semi-automatic, hand loaded application; the item is placed into a cradle made up of three rollers. Once label application is initiated, the rollers then move together to capture and rotate the item. Once the item is rotating at a constant speed, a sensor locates a reference spot for label application and the system precisely dispenses the label so as to be applied accurately. 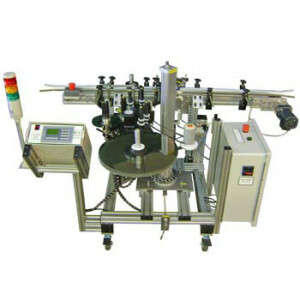 In the on-line fully automatic process, an item being conveyed along a production or packaging line will be first properly spaced and then transported to the label application location where a sensor detects the product and initiates the complete labeling sequence as described above; the three rollers capture the item, spin it at a fixed speed and apply the label exactly where it needs to be located. Following the complete label application the product is automatically moved beyond the labeling location and a new product is moved into place to begin the process again. Once programmed, this is a completely seamless process. Printing on labels employed in such an application process can be accomplished with several different print technologies depending on the amount of information to be printed. On-line printed messages can be as simple as a Lot Number and Expiration Date, or as long as a full ingredients list, or as large as a product warning that must be easily seen. When you’re production levels require that you increase product throughput or labeling accuracy on your complex cylindrical product, contact Griffin -Rutgers to discuss your need and determine the specific labeler to meet your requirements. You can contact us by calling 1-800-237-6713 or emailing us at custserv@griffin-rutgers.com. Our team of experts will help you find the right system for your needs and budget. Posted in Label Coders, Labeling Systems, Labels, Labels & Labeling, Laser Printing and tagged re-pack.